Several York Catholic high school students were recently recognized by the Intercultural Dialogue Institute GTA for placing or becoming a finalist in the charity’s annual Creative Minds Youth Contest. High school students were invited to submit an essay, artwork and/or short video on the theme of Challenging Stereotypes – Embracing Uniqueness in Today’s World. The contest is an initiative of the Intercultural Dialogue Institute whose objective it is to open discussions about equity, inclusivity and diversity in the GTA. The contest encouraged students to explore and speak to topical social, cultural and environmental issues as a way to raise awareness and enhance empathy. 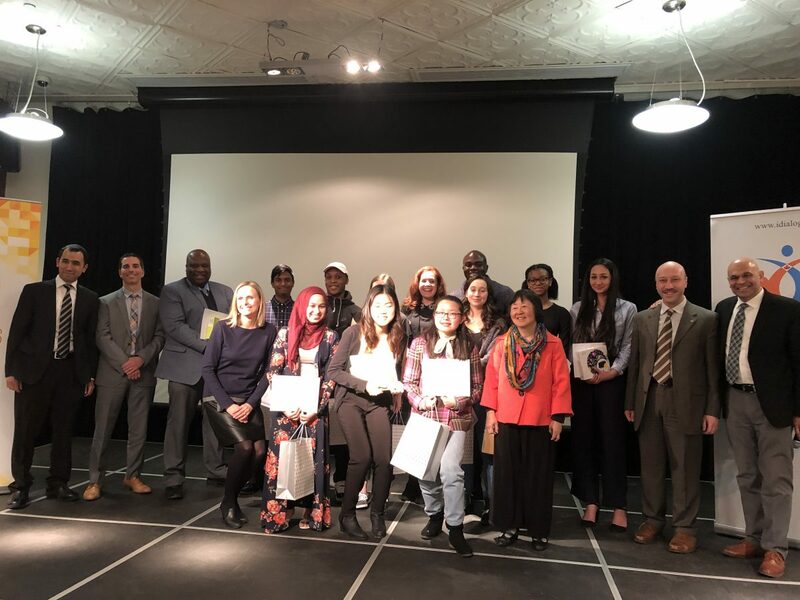 The awards ceremony took place at the Aurora Cultural Centre on March 26th and included several special guests including keynote speaker, Orlando Bowen, Founder of the One Voice One Team Youth Leadership Organization. Following greetings from local dignitaries and community representatives, professionals in the field of race relations, and the keynote address, the student finalists’ posters, essays, and videos were showcased and the first, second, and third place winners from each category were presented with their awards. Finalists included: Jennifer Sivaguru, Rhea Persaud, Jude Gabriel and Jack Devair, all of Father Michael McGivney CA. Finalists included: Michael Starcevic, Daniela Battilana and Rachel Gaspart all of St. Jean de Brebeuf CHS, as well as Michaelle Aquino and Stephanie Lee of Father Michael McGivney CA, and Aurora Martinucci of St. Joan of Arc CHS. The sole finalist in the video category was Safiyya Dandi of Father Michael McGivney CA.